An All-American dessert, this recipe is great for any fresh berries. We especially enjoyed this because strawberries were the first fruits in our garden. If we didn’t have time to make the cake. we would cube white bread; with the sugared berries and milk it was quite delicious. In mixing bowl, beat the eggs, shortening, and sugar until fluffy. Sift together the flour, baking powder, and salt. Alternate adding the ilk and dry ingredients into the shortening mixture until batter is smooth. Pour into a greased 9 x13″ baking pan or an 11″ Bundt pan and bake in preheated 350° F. oven for 50 minutes or until testing pin comes out clean when inserted. To serve, cut in squares and split. 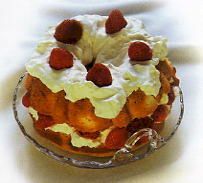 Put sliced and sugared strawberries between layers, add some whipped cream and whole berries on top. Or serve in a deep dish or bowl with milk–regular or sweetened. More than a cookbook… a collection of scenic Lancaster County country photographs entwined with Betty’s stories and recollections. Written from the heart and soul, this book passes on a traditional way of life as well as some of the best Pennsylvania German country recipes. With vivid memories of her childhood, Betty Groff recalls the ways of family farm life among the “plain people” of Lancaster County, Pennsylvania. The recipes for the delicious food from her family’s kitchen have been passed down and perfected by Betty’s decades of experience as a restaurateur. Basics, light fare, and exquisite traditional main and dessert dishes are easily prepared from Betty’s easy-to-follow recipes using plenty of garden vegetables and fresh fruits. Beloved for preserving Pennsylvania German culinary arts, this book presents the best of Betty’s stories and recipes in her tradition. 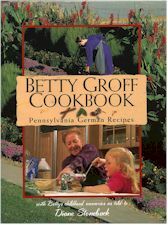 Betty Groff Cookbook: Pennsylvania German Recipes: And to order this book just go to http://www.Amishshop.com.